Bookends: The Stroke of Midnight: A Supernatural New Year's Anthology ~ Excerpt and GIVEAWAY! The Stroke of Midnight: A Supernatural New Year's Anthology ~ Excerpt and GIVEAWAY! It's New Year's Eve and the supernatural community is ringing in the New Year with style! Fourteen of your favorite authors have come together to bring you The Stroke of Midnight: A Supernatural New Year's Anthology! 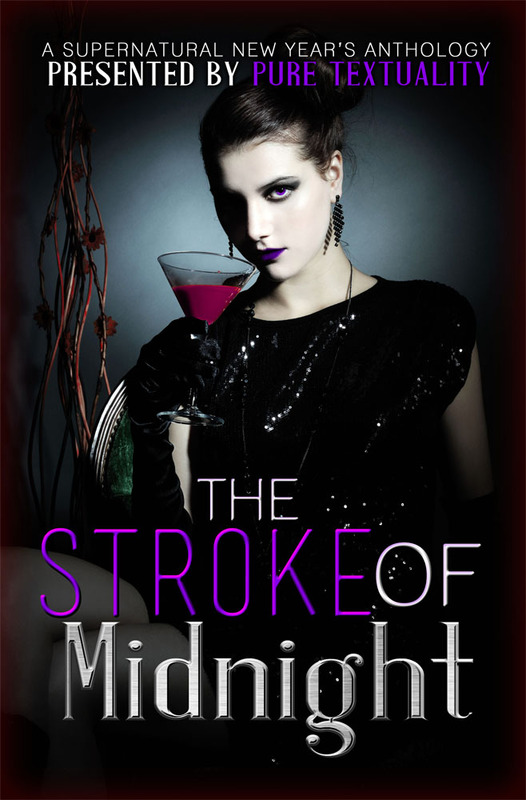 The Stroke of Midnight features fourteen urban fantasy/paranormal short stories. Celebrate the turn of the year with all the creatures that go bump in the night! Short stories may contain adult/graphic content. Mortimer, I have really cherished our time together, but I seriously think if I start introducing my imaginary friend to my boyfriend he’ll bolt out the door quicker than I can say ‘schizo.’” She put her hands on my forearms in an effort to comfort me. My wings fell in defeat, along with my sagging shoulders. “Is that what you think of me? You think I’m an imaginary friend? “Mortimer, why wouldn’t you want me to—” She cut herself off, having realized the truth of it. “I, uh, seduced a werewolf and got him caught in a bear trap,” she rushed out. Fifty sit-ups would have to do. I sat up and ran my gaze over her. She had scratches on her face and hands as if she’d been running through the woods. “What did he do?” I hoped it wasn’t something that would require me to kill him. He wasn’t eighteen yet. I really needed to wait until after he’d reached the legal age to do something that extreme. Well, it could have been worse. He could have filled it with snakes or spiders or something even more horrifying. With a werewolf, the possibilities were endless. Ouch. He must still be upset with her for breaking his nose and kneeing him in the balls back on Valentine’s Day when he’d tried to crash her party. The song was sort of romantic in a weird kind of way, though. I wanted to be angry with the guy, but nothing he’d done so far had really hurt her. Just minor pranks like this and sending her badly written poems. Oh, and that time he showed up outside our house on a full moon with a bloody rabbit between his teeth. He’d left that for her as a gift, though Emily hadn’t found it very amusing. “Is that why you’ve been shutting your cell phone off every time it rings lately?” I lifted my brows. Emily appeared to be a cheerful and open person, but if you tried to dig too deep she’d put up defensive walls. Life had already damaged her pretty badly by the time I found her and it was taking a while for her to open up. I tried not to push her too hard, hoping she’d learn to trust me and talk things out when she was ready. Daisy looked disappointed, and I patted her arm. “Sorry, Daze. Not quite the New Year’s you were hoping for,” I said. I had already pushed back my chair and was beginning to stand when Blair’s body went rigid. “Oh!” she cried out. I sank back down into my chair, wondering if Blair was about to give us another demonstration from one of the house’s professional women. Instead, Blair’s second cry turned into a wail. “Trapped! Trapped!” she shouted. She turned her head wildly, her eyes rolling in their sockets. “No way out! Trapped!” With one last wail, Blair began to sob. None of us moved. Finally, Charles’s wife Anita tentatively lifted a hand to Blair’s shoulder. “What happened?” she asked gently. Pure Textuality Public Relations is giving away a Kindle (6”, WiFi)!! !